"Vibrant, funny, and subversive." Remember all those movies you were obsessed with in high school? All those classic teenage comedies, coming-of-age dramas, telling stories of high school burn outs and maligned prom queens. 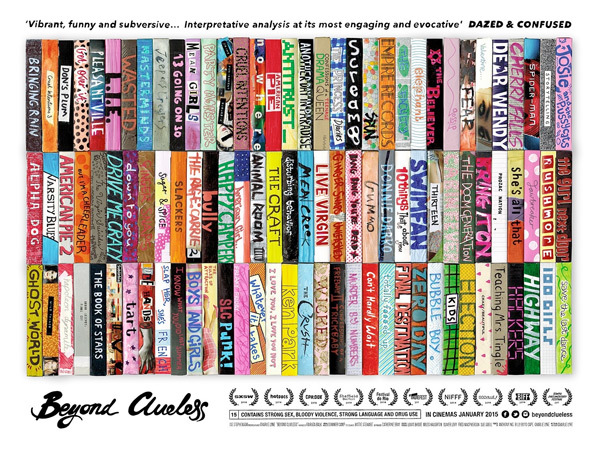 Young filmmaker Charlie Lyne made a documentary called Beyond Clueless, presenting a "PhD on the history of high school cinema" featuring a "moody and evocative score" by the band Summer Camp, which can be heard briefly in the trailer. Our friends at Empire have unveiled the first poster and it caught our eye. For marketing made up entirely with their own material, no footage, this is excellent work. I'm very curious to check out the doc and many will likely feel the same after taking a look at the film below. Click on the image above for high res showing all the titles spanning Bringing Rain to Save the Last Dance. Narrated by cult teen star Fairuza Balk (of Return to Oz, The Craft, America History X, The Waterboy, Almost Famous), Beyond Clueless is a dizzying journey into the mind, body and soul of the teen movie, as seen through the eyes of over 200 modern coming-of-age classics. The documentary is written and directed by newcomer Charlie Lyne (on Twitter @charlielyne), a young film reporter for The Guardian and editor for Ultra Culture turned filmmaker. The cinematography in the trailer is by Evan Burris Trout. For more info on the doc, visit the film's official website. Beyond Clueless premiered at the SXSW Film Festival in March and will debut in UK cinemas starting in January, but has no US release date set yet. Stay tuned for any updates. Grew up on a lot of these films, so this is definitely a must watch for me. Ah man...why are they making these kind of films for my formative years??? !